Subacromial impingement syndrome (SAIS) refers to the inflammation and irritation of the rotator cuff tendons as they pass through the subacromial space, resulting in pain, weakness, and reduced range of motion within the shoulder. SAIS encompasses a range of pathology including rotator cuff tendinosis, subacromial bursitis, and calcific tendinitis. All these conditions result in an attrition between the coracoacromial arch and the supraspinatus tendon or subacromial bursa. It occurs most commonly in patients under 25 years, typically in active individuals or in manual professions, and accounts for around 60% of all shoulder pain presentations, making it the most common pathology of the shoulder. The subacromial space lies below the coracoacromial arch and above the humeral head and greater tuberosity of the humerus. 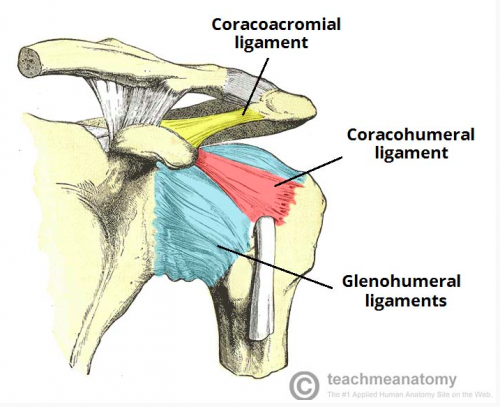 The coracoacromial arch consists (lateral to medial) of the acromion, the coracoacromial ligament (anterior to the acromioclavicular joint), and coracoid process. Within the subacromal space run the rotator cuff tendons, the long head of biceps tendon, and the coraco-acromial ligament, all surrounded by the subacromial bursa which helps to reduce friction between these structures. The most common symptom of SAIS is progressive pain in the anterior superior shoulder. The pain is classically exacerbated by abduction in the affected shoulder and relieved by rest, and may be associated with weakness and stiffness secondary to the pain. Neers Impingement test – The arm is placed by the patient’s side, fully internally rotated and then passively flexed, and is positive if there is pain in the anterolateral aspect of the shoulder. Hawkins test – The shoulder and elbow are flexed to 90 degrees, with the examiner then stablising the humerus and passively internally rotates the arm, and the test is positive if pain is in the anterolateral aspect of the shoulder. The diagnosis of impingement is a clinical one, however it is often confirmed via additional imaging. 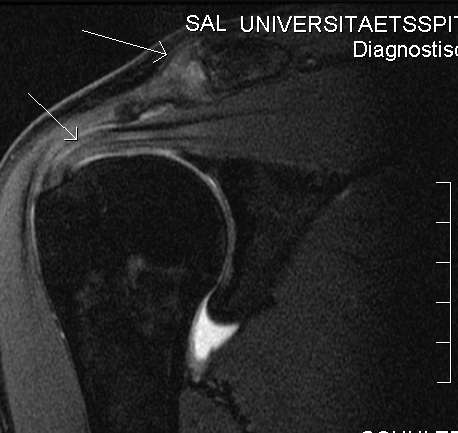 MRI imaging of the affected shoulder is often the mainstay of imaging for SAIS. Features that can be seen in affected individuals include formation of subacromial osteophytes and sclerosis, subacromial bursitis, humeral cystic changes, and narrowing of the subacromial space. Conservative management is the mainstay of treatment in most cases. Patients should have sufficient analgesia, typically non-steroidal inflammatory drugs, and regular physiotherapy, including postural, stability, mobility, stretching and strength exercises. For those who require further intervention, corticosteroid injections in the subacromial space can be trialled. Patients should be educated appropriately with adequate warm-up techniques and monitoring for early signs of worsening impingement. If SAIS persists beyond 6 months without response to conservative management, surgical intervention is recommended. However, recent evidence from a randomised surgical trial showed that surgical decompression appeared to offer no extra benefit over arthroscopy alone, and indeed that the benefits seen from the surgical intervention might only be the result of a placebo effect or the increased post-operative physiotherapy. Complications of SAIS include rotator cuff degeneration and tear, adhesive capsulitis, cuff tear arthropathy and complex regional pain syndrome. If diagnosed and assessed early, SAIS resolves with conservative management in 60 – 90% of patients. What is the characteristic symptom of subacromial impingement syndrome? Which of the following tests is used in the diagnosis of subacromial impingement syndrome? Which of the following is NOT typically used in the conservative management of subacromial impingement syndrome?